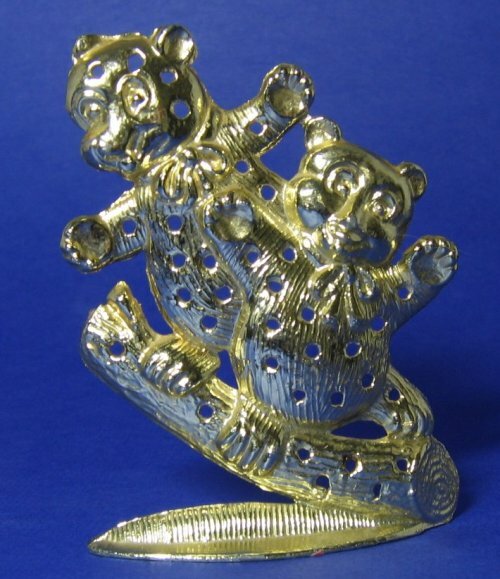 Vintage Torino Bears Earring Tree - Two Bears Balance on a Log! Two bears with bows balance on a log as if they were surfing. A TORINO quality earring tree display holder! Goldtone, 3 1/4" tall x 2 1/2" wide. Embossed TORINO copyright. Minor wear on noses and back of log. Underneath has missing goldtone from an ill removed price tag. Base measures 2 1/2" x 1".